Commercial Door Repair is a something we do everyday. Each door presents different challenges and security needs. Call us for an evaluation of your door locking devices or door repair questions. An electric strike is simply an access control device used for doors. They are sometimes equipped with buzzers that allow someone outside the door know when the door is open. There are many manufacturers ( HES and Von Duprin are the most popular) and many things that need to be considered such as voltage requirements, type of door locking hardware needed and whether a fail-safe or fail-secure electric strike is needed. Community Commercial Security can give you the proper guidance to make the best choice for your business. A magnetic lock or maglock is an access control method that uses electromagnetic theories and DC current to keep a door locked. A magnet is placed inside the door which can prevent tampering. When the magnet is connected to an electrical source the magnet holds the door in place. Mag locks are used when electric strikes cannot be used due to existing hardware. Mechanical door closers use electrical power instead of natural energy that is stored in the closer by opening it. They often come with a remote control advice and can include a security alarm that you can set as needed. Manual door closers features a hydraulic damper or spring mechanism. The door opener stores energy generated when the door is opened. The stored energy then closes the door automatically without action or force to close it. Door Closer- Which type works for me? Debris such as dirt, rocks, sand, ice etc. Panic or crash bars are a form of a lock used to unlock a door during emergency conditions. When the lever is either pushed or depressed, it activates a mechanism that unlatches the door allowing occupants to leave quickly from a building. 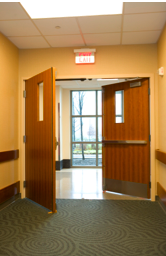 These types of exit devices can typically be found at Emergency Exits which are required in most public buildings due to fire and building codes. Panic hardware is often required by OSHA and in most municipal settings in order to comply with the National Fire Protection Association Life Safety Code ( NFPA 101) and with the National Electrical Code (NFPA70). Secure Lock and Alarm has Licensed Low Voltage Electrician on staff so we are up to date on how each commercial installation needs to be done in order to comply with local codes. We are Orange County’s Full Service Commercial Door Locksmith so call us with any questions.